A While back I did a Logic Abecedarian here on logic pro expert. Twenty-six posts on Logic, each focusing on a topic relating to a letter of the alphabet. A few years have gone by, and many of the posts did not survive the transition to the revamped site format. Plus, Logic has come a long way in the ensuing years! 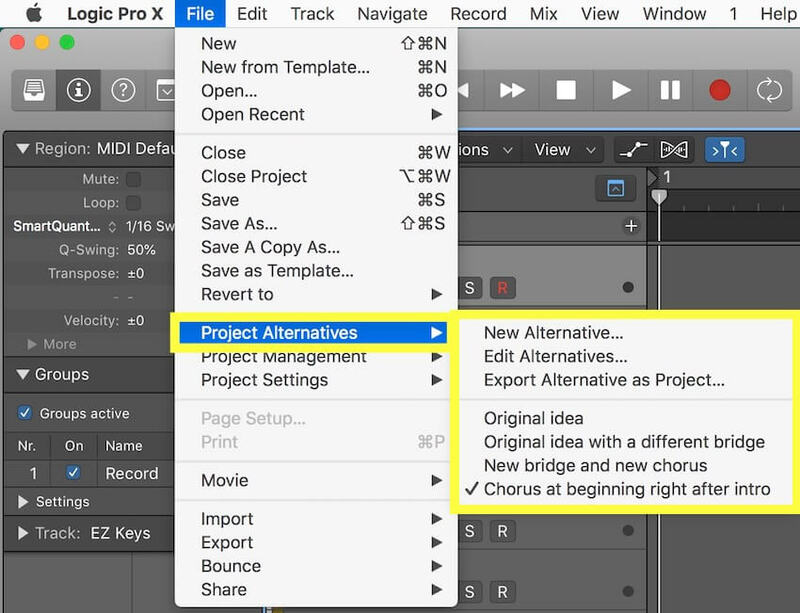 It’s time for a fresh up to date set of Logic Pro X From A to Z posts. With a new team in place; it’s time for new subject matter and perspectives. An obvious choice for the letter A might be automation. I did Alias in my original series. But I’d like to focus here on Alternatives. Specifically Project Alternatives. How many of us actually use project alternatives? Why do we like, or not like, them? I have to confess, like many old time Logic users, I have been slow to make the transition to project alternatives, versus the good old fashion “save as” routine we’ve used for years when needing to version a project in progress. Admittedly project alternatives are neater. There are fewer files to manage in the Finder. Less chance of user error either moving or deleting the wrong project, or saving to the wrong location. But are the advantages worth the drawbacks? A few skeptics have said that project alternatives solve a problem that didn’t exist. After all, Save As has worked fine for all these years. I think this is accurate for users who use the files and folders structure. But for projects saved as packages, they are necessary. Functionally they are the same as using the “save as” command, but with a little less clutter on the hard drive. In the Finder, you can hit the Spacebar on a selected project file to see a list of the available alternatives. And you can directly open each one from there. You can select which alternative to import from in the import window. For users who prefer working with the “everything together” package file format rather than the files and folders directory structure, project alternatives are clearly necessary so that project related media is not duplicated each time a new version is created. Loading project alternatives are just like loading another project. There is no advantage in loading time. All samples, audio files, and instruments are reloaded, just like when launching a new project. Sometimes, as a project is evolving, you want to erase or pare down some of your existing audio files. Maybe there are unused takes you want to delete or ideas you tried and have decided to abandon. With project alternatives, this is not possible, as it will make loading previous alternatives problematic. You can’t send one project alternative on its own to a collaborator without messy file management without having to take the additional step of using the Export Alternative As Project function. Which results in more file management and versioning to keep track of. With Save As, you can see other versions of your project directly in the Finder without having to first select a project and hit the Spacebar to peek into the package contents. In the case of corruption or data loss, you may lose all versions of your project. With save as there are different physical files on your hard drive that you can revert to if necessary. A useful tip, relevant to both project alternatives and “save as” versions, is that you can launch Logic while holding down the Control key in order to launch it with no audio engine. This allows you to quickly search through alternatives” or “save as” project files for versioned MIDI or audio data without the time consuming process of loading/unloading all of the plug-ins each time. Adopting this relatively new file management feature has been easier for some than others. Many Logic users prefer to have everything together in Package based project management instead of the folder based workflow. Some of them are coming from Garageband, which only uses the package format. So being used to this from the beginning, it’s easy to see that they are more comfortable with it. After all, is said and done, what do you prefer? I do occasionally use project alternatives. Specifically at the very beginning of the song creation process where I may be trying many ideas before zeroing in on the direction I want to take the project in. But once I am underway and charging ahead with a full head of steam, I prefer using “save as”. Apart from the consolidation of files on the hard drive, I don’t see enough advantages to project alternatives. I don’t mind managing the files in the Finder myself. In fact, I prefer being able to directly and easily see and control exactly what is going where. But that’s me. What about you?